Designed for processing stereo imagery captured from various satellites, aircrafts and drones with and without camera information. Photogrammetry process uses camera model and RPC imagery information. A simple automated workflow, highly accurate survey grade outputs and high-speed parallel processing makes the IGiS Photogrammetry Suite unique. The fully automated workflow of IGiS Photogrammetry covers all steps of stereo processing including mosaicing, GCP extraction, bundle block adjustment, tie point generation, alignment, masking, correlation, triangulation, creating 3D photogrammetry models, DEM generation, hole-fill and smoothing. Novice users can use the automated suite without any prior training using the user-friendly GUI while professionals can use individual modules. The suite also contains advance tools and scripts/macros for batch processing and tailored solutions. After a long and rigorous R&D, we have successfully developed efficient algorithms to achieve survey-grade accuracy using high-speed GPU and core based processing. There is no data size limitation for processing and analysis. It produces cartographic products, including Digital Surface Models (DSMs), Digital Elevation Models (DEMs), and Ortho Rectified Imagery with accuracy report. A user can export final output in different formats like Raster DEM, vector 3D points and 3D Mash/TIN for further visualisation and analysis. 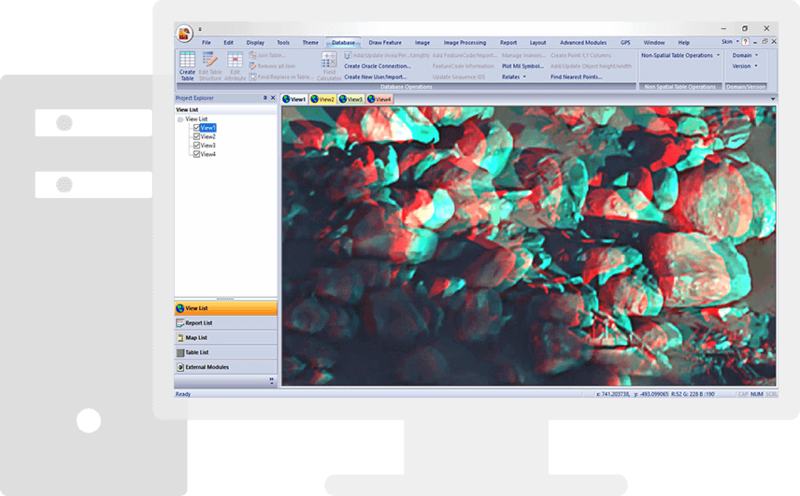 IGiS Photogrammetry suite provides a wide array of tools to process and analyse DEM/DTM and 3D photogrammetry point vector data. Seamless mosaicing for advanced visualisation and analysis is carried out by DEM and 3D Point Mosaic tools. An advance analysis can be done using tools like DEM to Contour, Volume Calculation, 3D Change Detection, DTM to DSM, Slope, Aspect, Hill-Shade, DEM hole-fill and smoothing.